Folsom Funeral Service » Johnson, Mary C.
Mary Charlotte (Garner) Johnson, a lifelong resident of Norwood, died Thursday, January 31, 2019 at the Norwood Hospital in Norwood. She was 94. Mary was born February 8, 1924 in Norwood, the only daughter of James and Hannah (Weston) Garner. She graduated from Norwood High School and worked briefly as a dental assistant before marrying her late husband, Donald Lorimer Johnson. 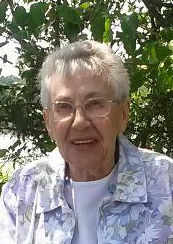 She was a member of the United Church of Norwood and the Norwood Senior Center. Mary enjoyed oil painting, cooking, and crafting. She is survived by her two sons, Donald Corey Johnson of Norwood, and Robert Garner Johnson, and his wife Elaine, of Parma Heights, OH; her two daughters, Carole Ann Lauriat, and her husband George, of Carver, and Laurie Elizabeth Hoffmann, and her husband Steven Belcher, of Billerica; her three grandchildren, Emma Lauriat, Laura Johnson, and Robert R. Johnson; and her brothers, Jack Garner of Osterville, and Donald Garner of Norwood. She was the sister of the late Edward Garner, and the late James Garner. Visitation with Mary’s family will be held Saturday, February 9th from 9 to 10 am at the Folsom & May Funeral Home, 85 Nichols Street, Norwood followed by her funeral service in the funeral home at 10 o clock. The Reverend Kevin Smith of the United Church of Norwood will officiate. Interment at Knollwood Memorial Park in Canton will follow the funeral. Donations to the American Parkinson’s Disease Association, 72 East Concord Street, C3, Boston, MA 02118 would be appreciated. You will missed. A woman who had a unwavering commitment to her family. A big beautiful smile and a warm inviting laugh. People liked being around you. Rest in peace. Don, our thoughts and prayers are with you and your family. It’s so difficult to lose a loved one who has been a part of your life for so long. The experiences you shared together are the memories you’ll have forever. We were saddened to hear of your loss. Please know that we will be thinking of you during this time. Aunt Mary I loved your gentle nature and your big beautiful smile. Never was there a day as I was a young child till now that I did not see your smile. A very talented and crafty woman and homemaker. To the rest of our family we truly know what a precious gem she was. May you rest in peace in Heaven.